If you’re looking for delicious vegan donuts, look no further! 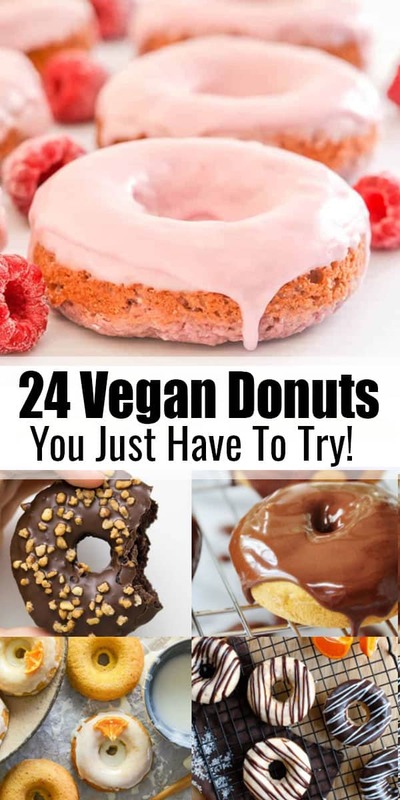 We’ve got you covered with 24 drool-worthy vegan donuts that are super easy to make and that are sooo delicious!! Welcome to donut heaven! Don’t these vegan donuts look super delicious? I wish I could just grab one from the screen! 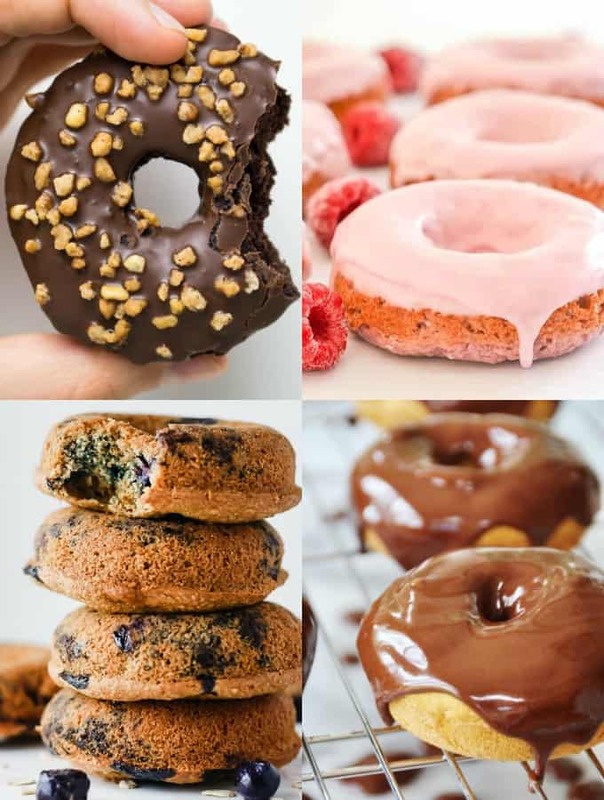 This roundup includes vegan gluten-free donuts as well as healthier donuts with whole wheat flour and natural sweeteners. I’ve heard this question so many times. And the answer is a big YES. While regular donuts contain eggs and milk and are, thus, not vegan, vegans can still eat donuts. It’s super easy to make vegan donuts or even veganize your favorite donut recipes. Just use almond, soy, or oat milk instead of cow’s milk. You’ve also got many different options to replace the eggs. Like regular donuts, most vegan donuts call for all-purpose flour. However, you could also use whole wheat flour, spelt flour, or even oat flour. Instead of cow’s milk you can use a plant-based milk alternative such as almond milk or soy milk. All of these egg replacements work similar to eggs in baked goods. Bananas for example add moisture while flaxseeds work really well for binding. And of course you can add a chocolate glaze on top. Just use dark chocolate that doesn’t contain any milk ingredients. Or get a bit more creative and add other flavors to the glace like lemon, vanilla, or even fruits like strawberries or raspberries. Where to buy vegan donuts? In most cases, it’s still very hard to buy vegan donuts. Finding vegan donuts in normal supermarkets is unfortunately still very rare. However, keep an eye out when shopping at organic grocery stores or health food stores. Besides, many vegan coffee shops offer vegan donuts. So just google for vegan cafés in your area and check out the reviews online. Some may have vegan donuts you can try. Especially in big cities, more and more regular coffee shops offer vegan baked goods as well. Yaay! Peta posted an article about the best vegan doughnut places in the U.S., which could be helpful as well. Or check the Happy Cow app, which offers lists of vegan, vegetarian, and vegan-friendly restaurants worldwide. It could also help you to find vegan donuts nearby. How healthy are vegan donuts? I think in most cases vegan donuts are healthier than regular donuts. Mostly because many vegan donut recipes call for healthier versions of sweeteners such as maple syrup or even dates. Besides, the great majority of the donuts in this roundup is baked and not fried, which makes them much healthier. Some of the recipes also use whole wheat flour, spelt flour, or even oat-flour. If you’re allergic to gluten, you can also find many vegan gluten-free donuts in this roundup. But always keep in mind that vegan donuts are still a sweet treat that you don’t enjoy every day. 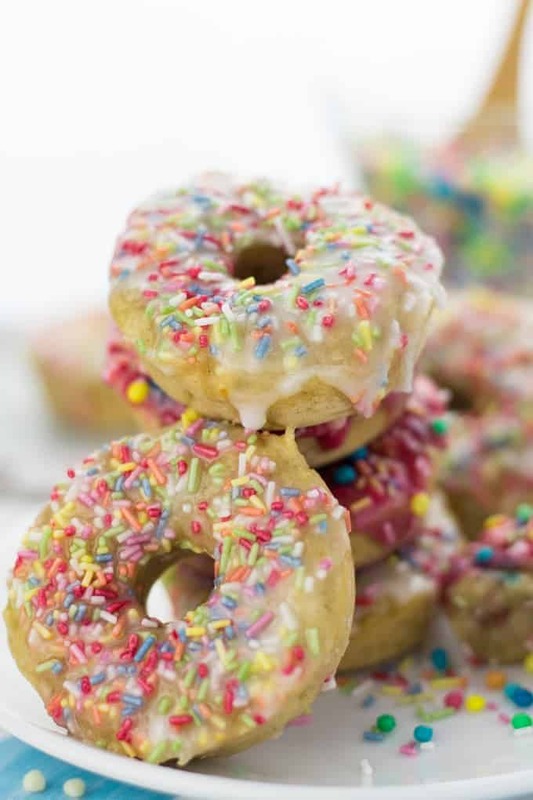 While there are some healthy vegan donut recipes out there, others are still loaded with sugar. But hey, I mean we’re talking about donuts, right? They need to be sweet! So I guess that’s enough info on vegan donuts and most of you are ready to see all of those delicious vegan donut recipes I talked about! So let’s get the yumminess started! 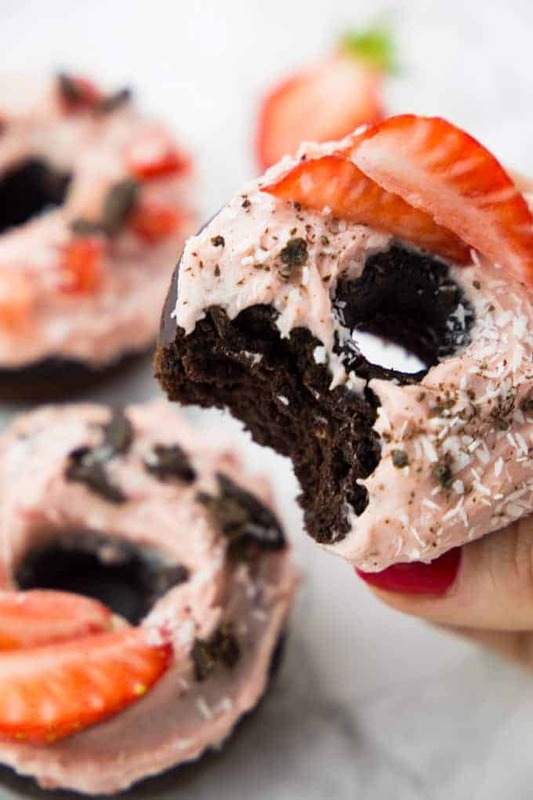 24 Drool-Worthy Vegan Donuts You Just Have to Try!! 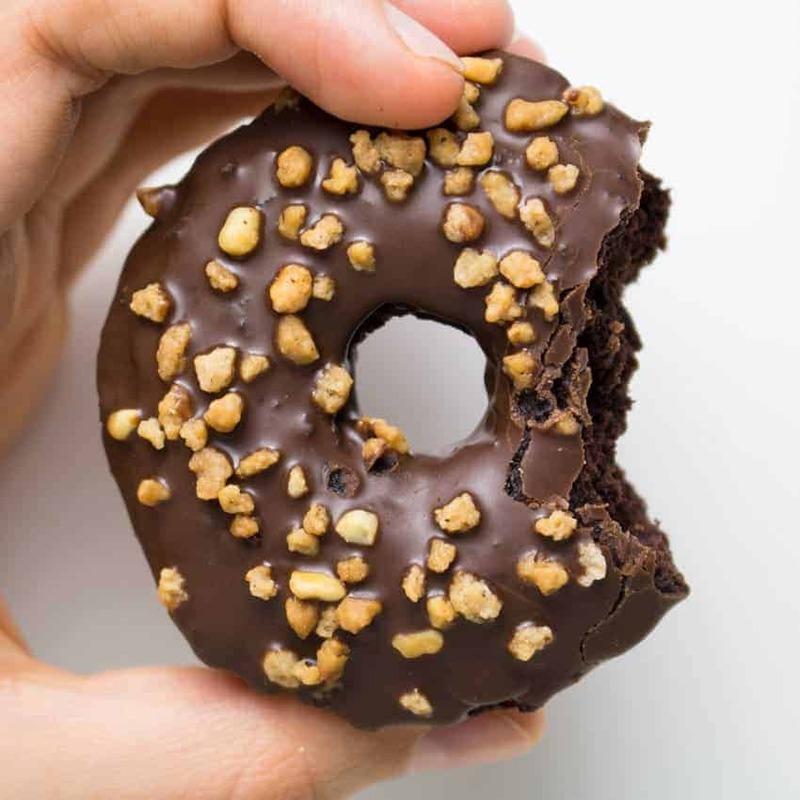 These vegan donuts with chocolate glaze and hazelnuts are pure decadence! They are baked, super fluffy and oil-free. And they’re made with a secret ingredient: kidney beans! This might sound a bit weird, but you don’t even taste the beans and they make an awesome texture. They’re a real crowd-pleaser and they’re among some of the most popular recipes on my blog! Have some of these goodies! 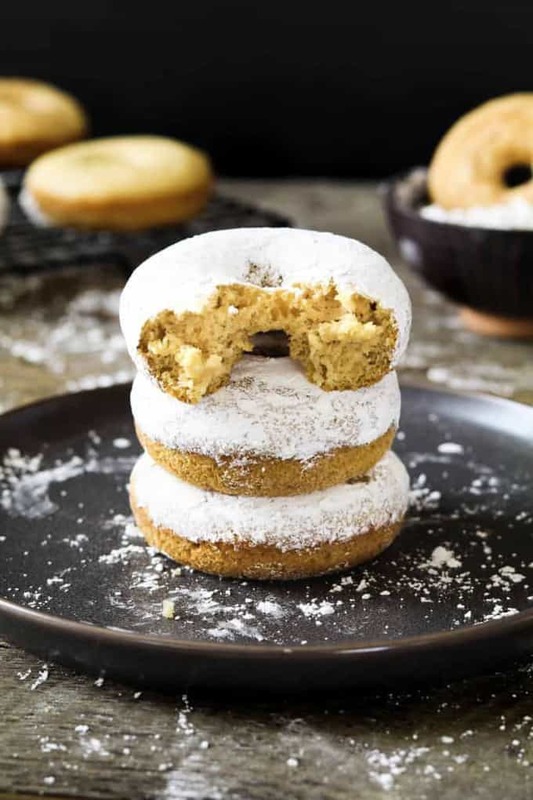 These vegan pumpkin spice donuts by Linda from Veganosity are super delicious and easy to make. The chocolate cinnamon frosting takes them to another level! They’re perfect for the colder seasons and make a great afternoon or breakfast treat! Looking for light donuts? 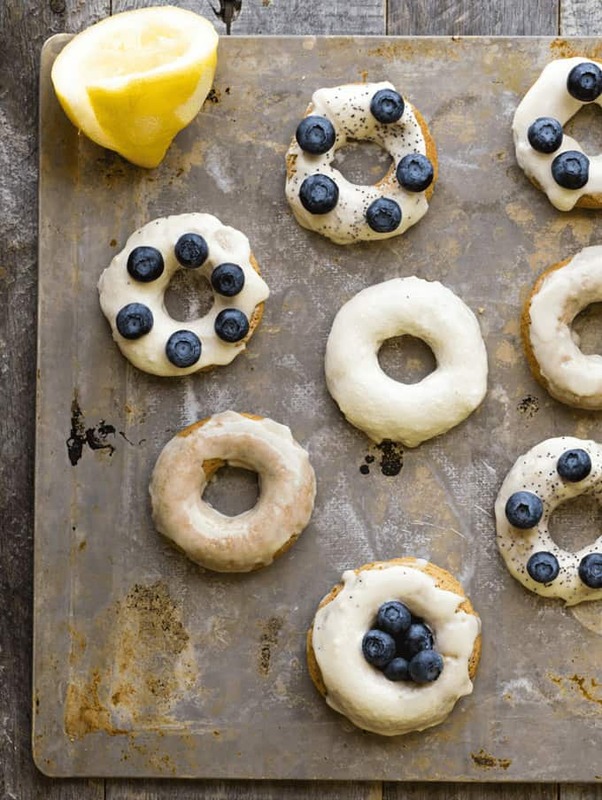 These vegan lemon poppyseed donuts by Kathy from Healthy Happy Life taste so much like summer! Kathy added a light vanilla frosting on top, which makes them even better. And don’t forget to add some fresh blueberries! 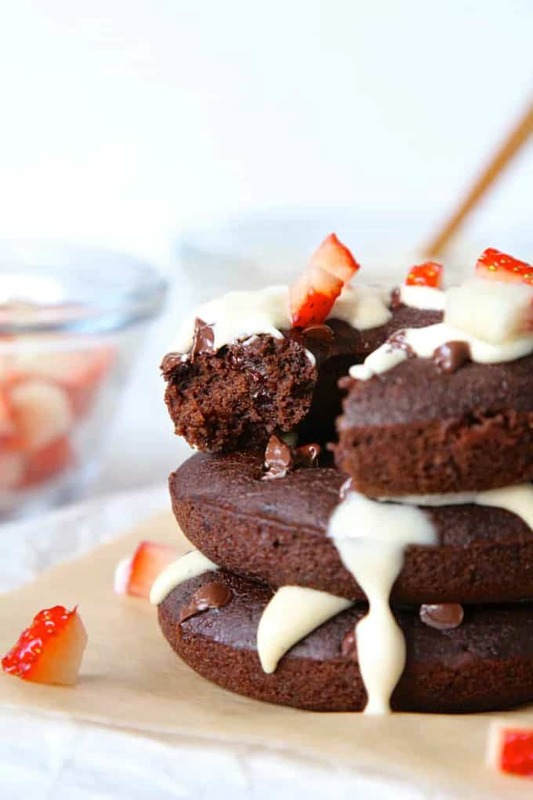 Do you love chocolate and strawberries? Then these donuts are perfect for you! 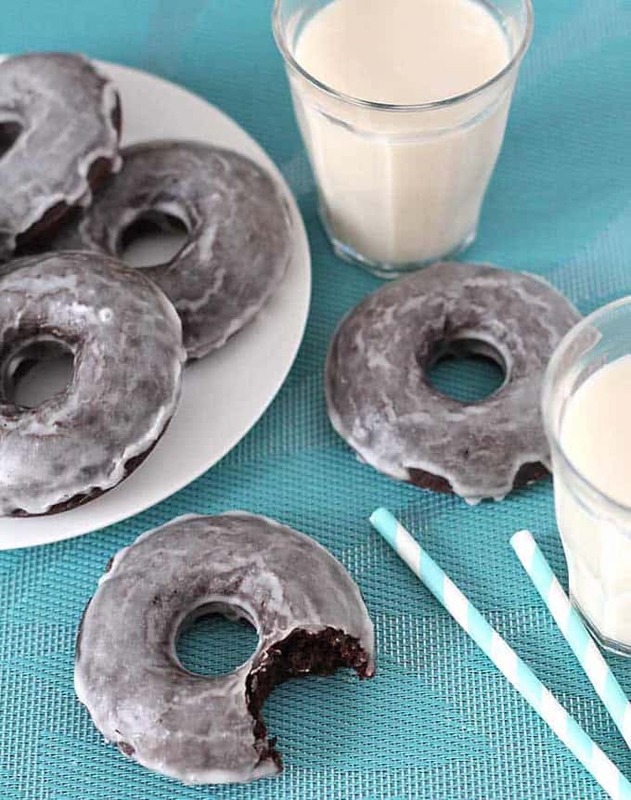 These vegan chocolate donuts are the perfect treat for summer! Or any time of the year! They’re super chocolatey with a creamy strawberry frosting topped with coconut flakes. Big YUM! Plus, they’re baked donuts, which makes them a lot healthier than regular fried donuts. These baked vegan blueberry donuts by Emilie from Emilie Eats are super sweet and fluffy! They make a satisfying breakfast, snack, or even dessert. 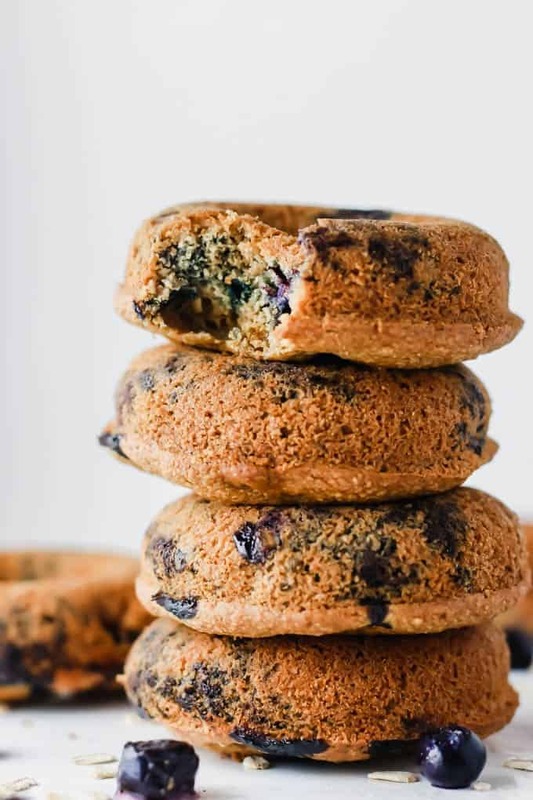 As Emilie wanted to make healthier donuts, she used wholesome ingredients like oats, blueberries, and almond butter. 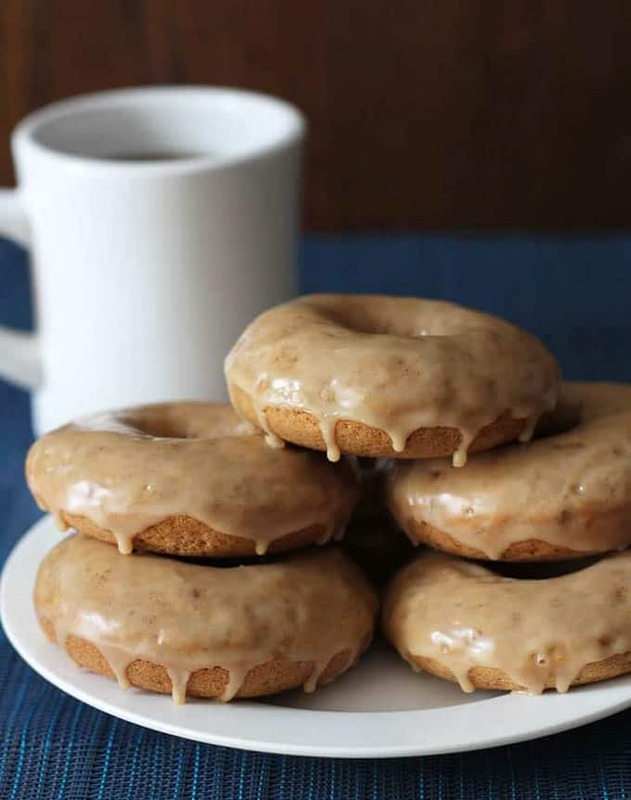 These vegan pumpkin donuts by Richa from Vegan Rich are super soft and perfectly spiced. And don’t forget to sprinkle them with cinnamon sugar. Richa also included a nut-free and a gluten-free option. Celebrate your next birthday with these soft, fluffy baked birthday donuts with rainbow sprinkles, vanilla and cherry frosting! They’re vegan and super easy to make. 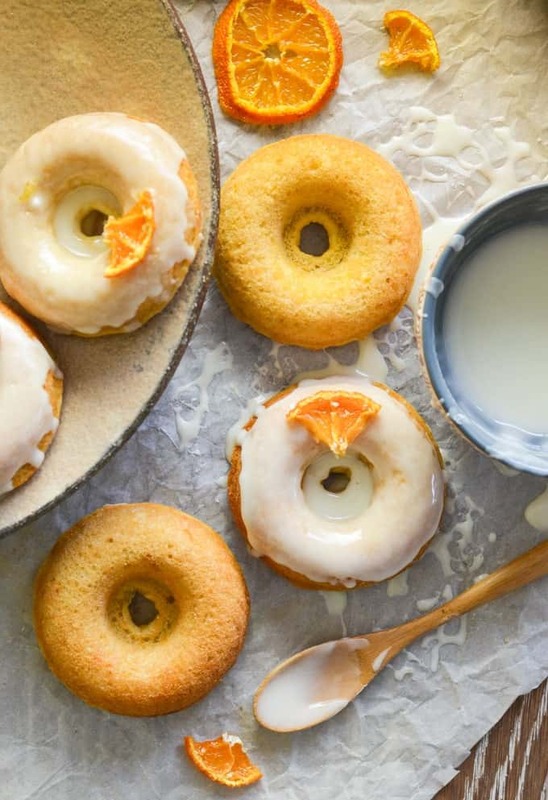 Don’t these sticky orange oil baked donuts by Melanie from A Virtual Vegan look delicious? They’re light, fluffy, and incredibly moist! And don’t forget to finish them off with a delicious orange glaze! 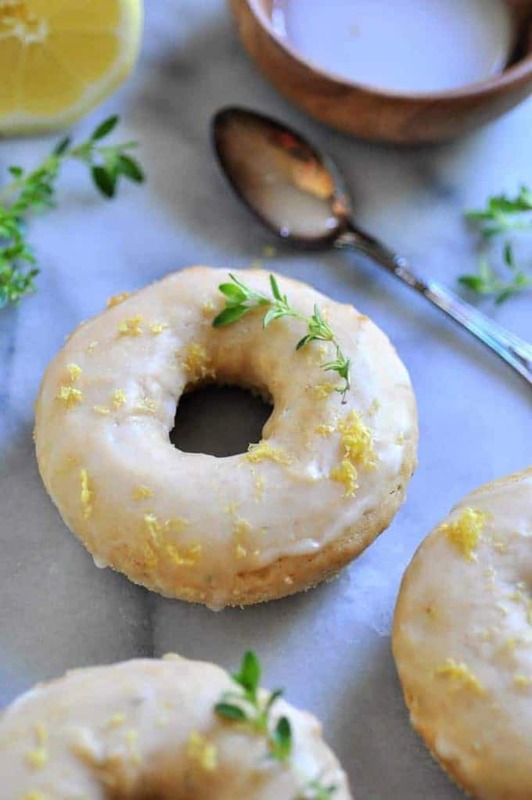 You’re going to love these vegan baked lemon and thyme donuts by Linda from Veganosity. It’s such a great combination of tangy lemon and savory thyme! Are you a fan of chocolate and bananas? 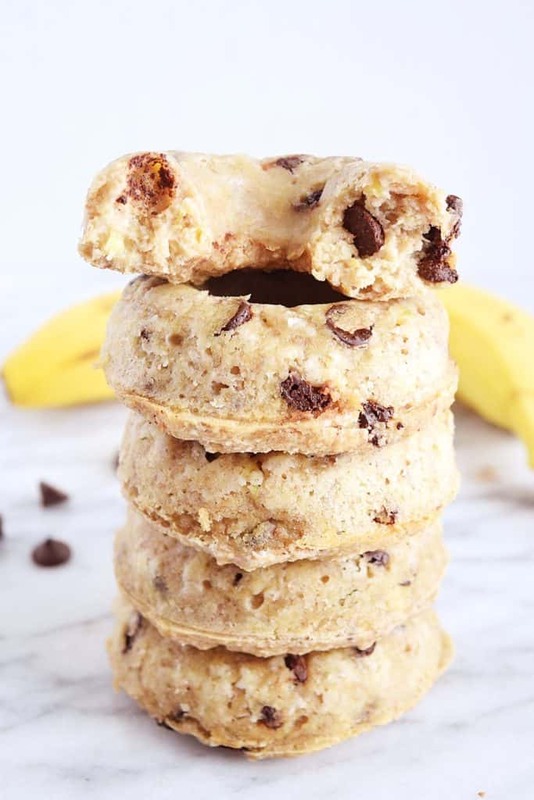 Then try these banana chocolate chip donuts by Sara from Beaming Banana! They’re soft, sweet, and full of banana flavor. Besides, they’re gluten-free and Sara used only natural sweeteners to sweeten them. These vegan powdered donuts by Melissa from Vegan Huggs are a lighter take on classic powdered donuts. They’re baked and, therefore, much lighter than regular powdered donuts. And what about savory donuts? These vegan maple bacon donuts by Sarah form My Darling Vegan are definitely not your usual donuts! 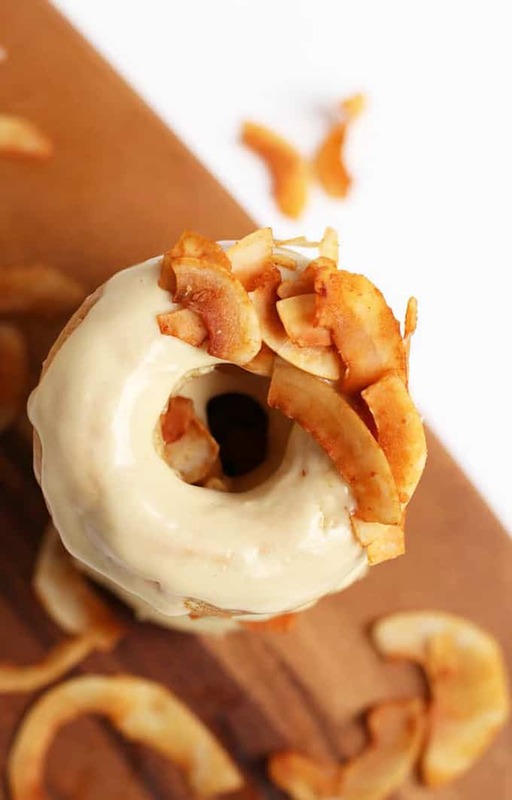 The have a sweet maple glaze and are topped off with crispy coconut bacon. Are you a friend of citrusy treats? Then these orange donuts with poppy seeds by Sarah from My Darling Vegan are perfect for you. They make a great breakfast or afternoon treat! 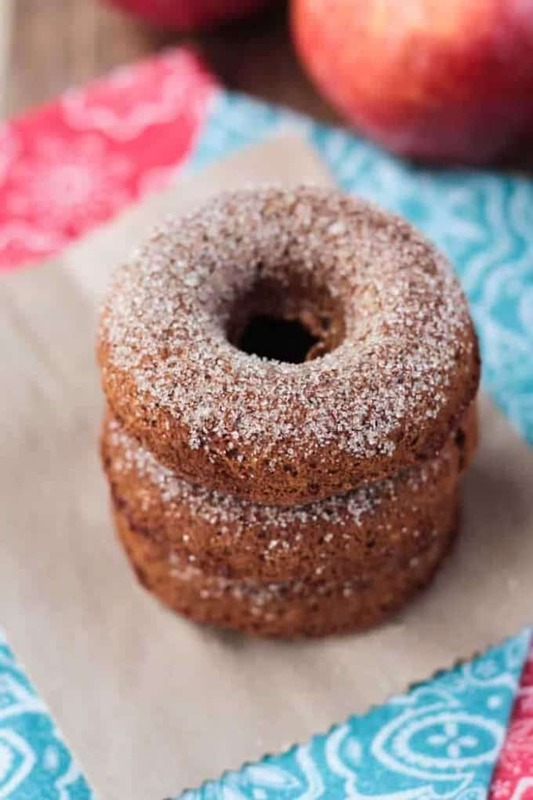 These baked apple cider donuts by Jenn from Veggie Inspired are super soft, fluffy, and moist. Just perfect for fall days! And of course they’re completely dairy and egg-free. 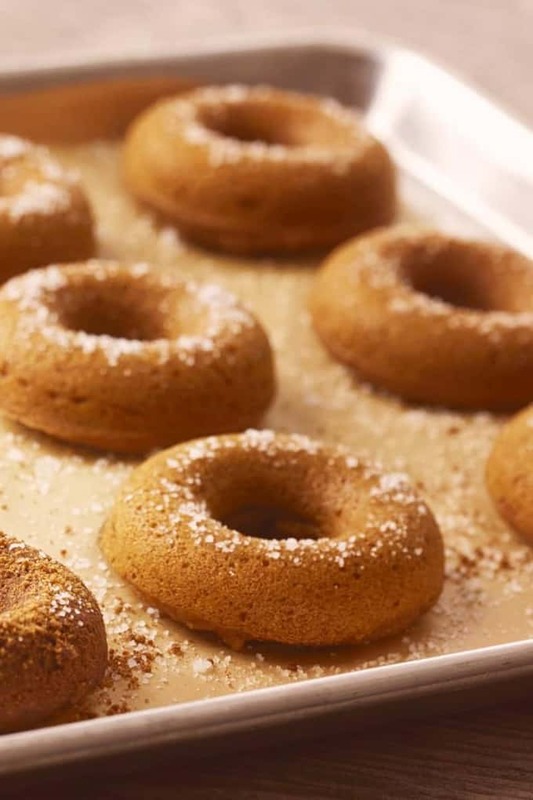 Besides, Jenn didn’t use any oil to make these fall-inspired donuts. 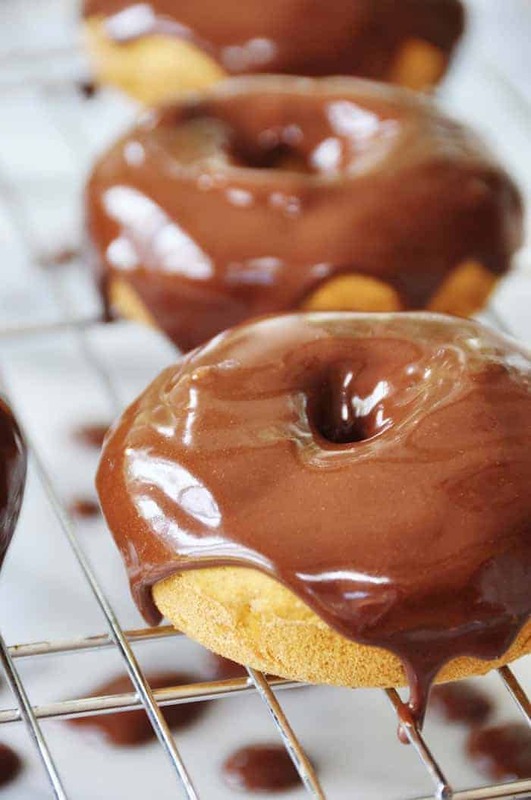 And of course we need some more vegan chocolate donuts for this roundup! 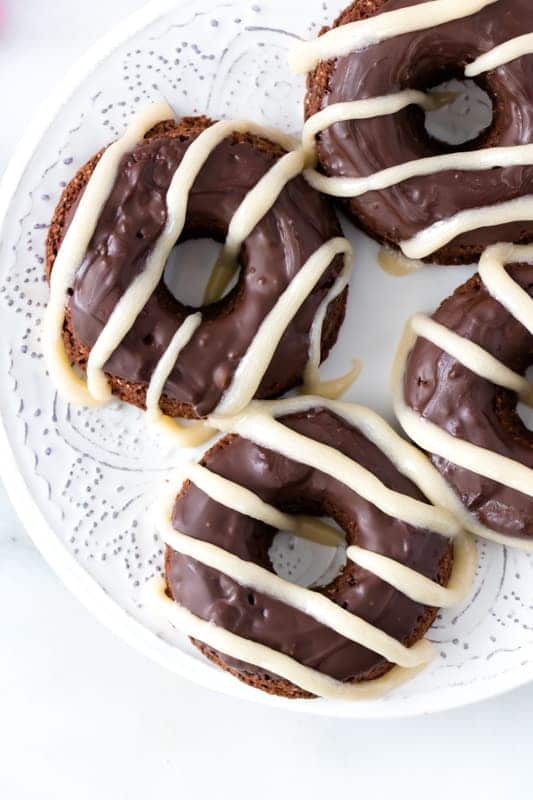 Don’t these gluten-free double chocolate baked donuts by Megan from Allergy Awesomeness look super good? They’re perfect for birthday parties! Don’t these maple donuts by Gwen from Delightful Adventures look like the perfect afternoon treat? Gwen also provided instructions to make them gluten-free! 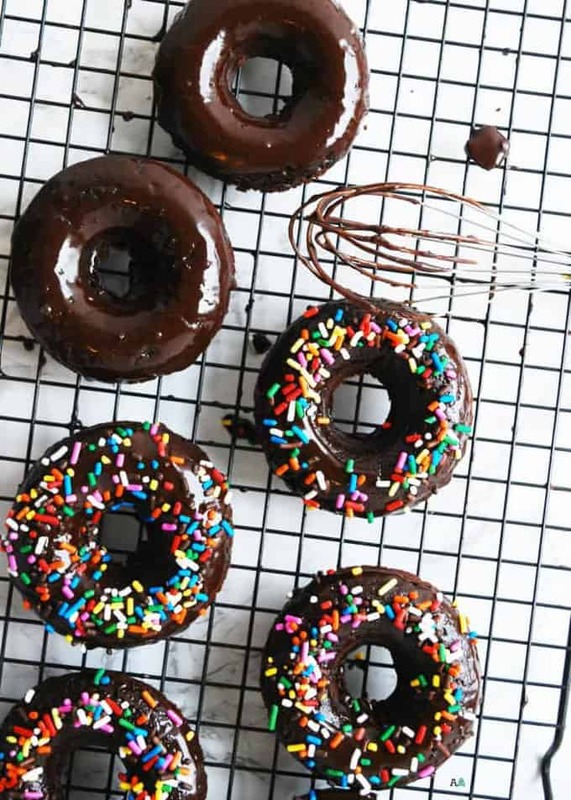 If you’re looking for healthy donuts, you should try these chocolate chia seed donuts by Elaine from Eating by Elaine. They’re vegan, gluten-free, and refined sugar-free. Besides, they’re easy to make and packed with healthy fats, whole grains, and protein. 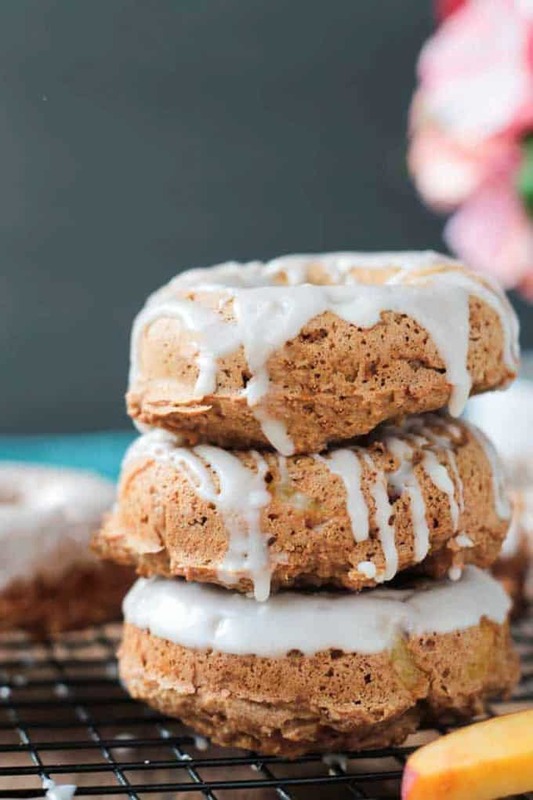 If you’re a friend of peaches and cream, you will love these peaches and cream donuts by Jenn from Veggie Inspired. Jenn used spelt flour and fresh diced peaches. And don’t forget to top them off with an easy sweet glaze! Are you looking for a sweet treat for a special occasion? Maybe Valentine’s Day? Then these double chocolate chip brownie doughnuts by Margaret from The Plant Philosophy are perfect for you. Serve them with cashew cream frosting and strawberries. These vegan baked chocolate chip donuts by Brandi from The Vegan 8 are so light, fluffy, and really easy to make. You just need one bowl and eight ingredients to make them. To make them perfectly moist, Brandi used a combination of vegan yogurt and applesauce. 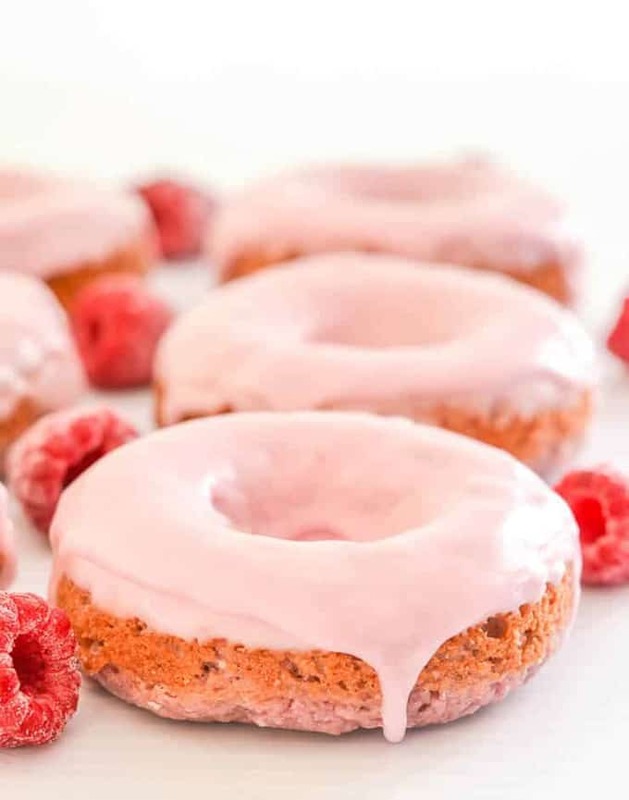 Don’t these vegan raspberry donuts by Melanie from A Virtual Vegan look pretty? I just love the pink glaze! And don’t worry if you don’t have a donut pan because you can also turn them into muffins. 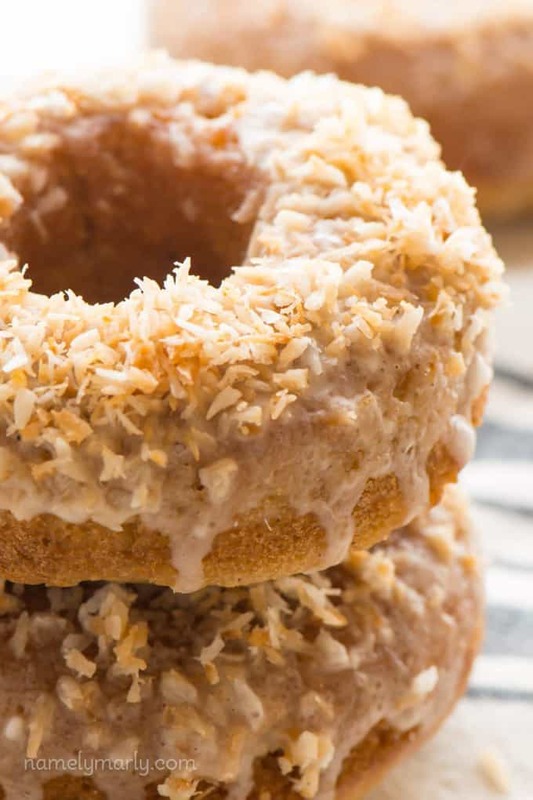 I absolutely love coconut and I wish I could just grab one of these vegan toasted coconut donuts by Marly from Namely Marly from the screen. They’re tender on the inside and crunchy on the outside. And like most of these vegan donuts in this roundup, they’re baked and not fried. You can never get enough of chocolate, right? 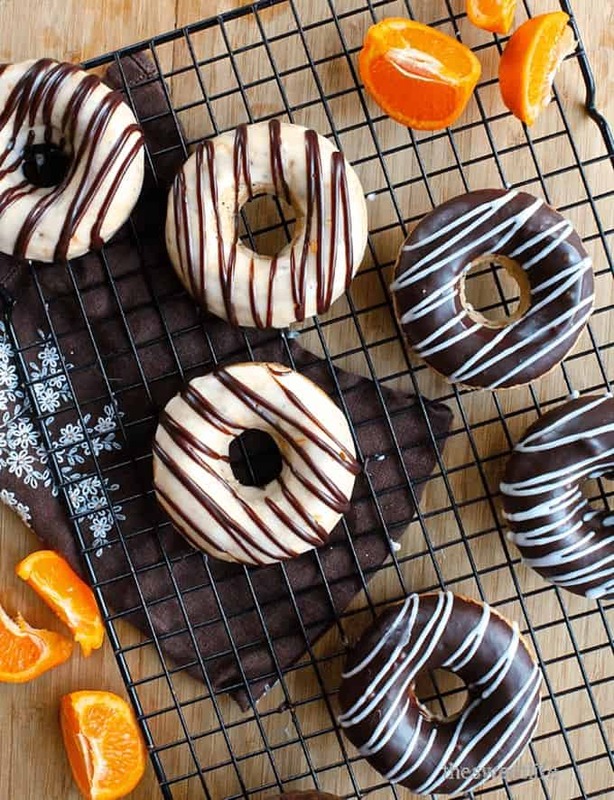 These vegan and gluten-free chocolate doughnuts by Gwen from Delightful Adventures look so delicious! And they’re sweet, fluffy, and soft! 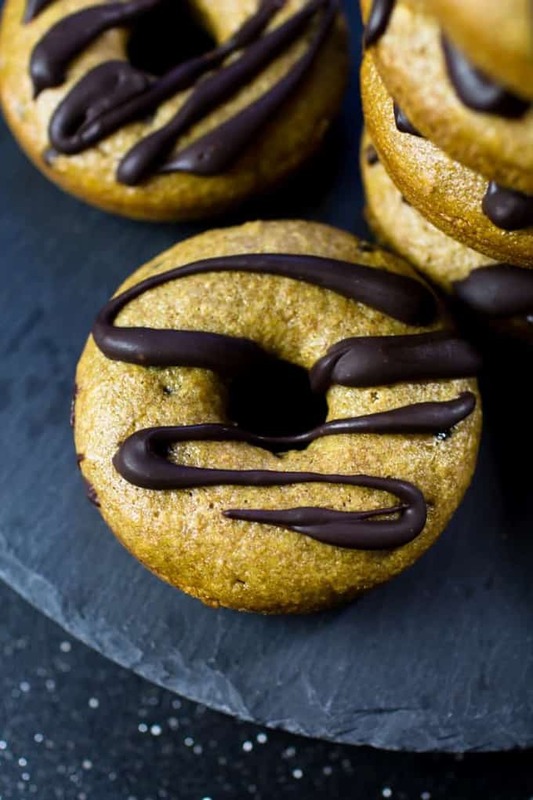 These vegan pumpkin donuts by Alisa from Go Dairy Free are perfect for fall! If you want these donuts to be gluten-free you can replace the spelt flour with oat flour and sorghum flour. I hope you enjoy these vegan donuts as much as I do! Don’t forget to pin or share this post so you have these recipes ready when you need them! 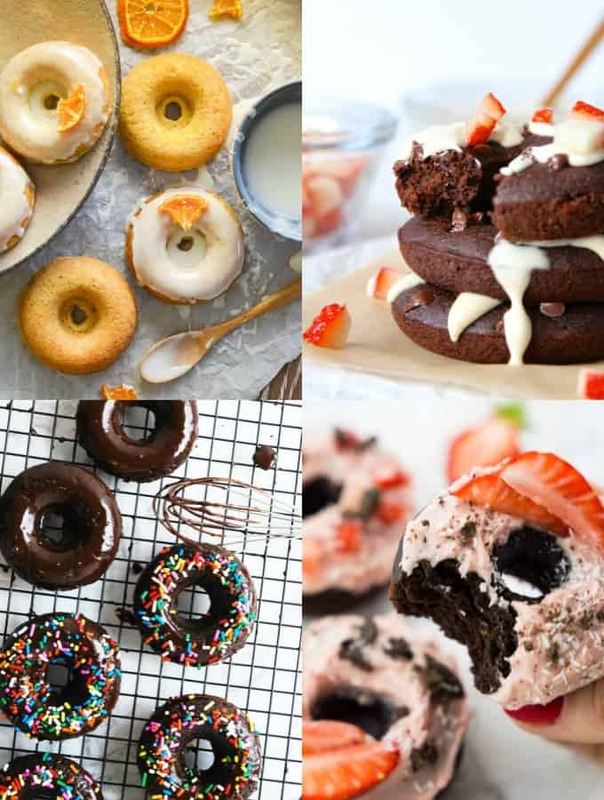 If you give any of these vegan donut recipes a try, I’d love to know what you think about it. Just leave me a comment below. Your comments really make my day! It’s 6:30 am and my mouth is watering for doughnuts! This is such a great post, Sina! 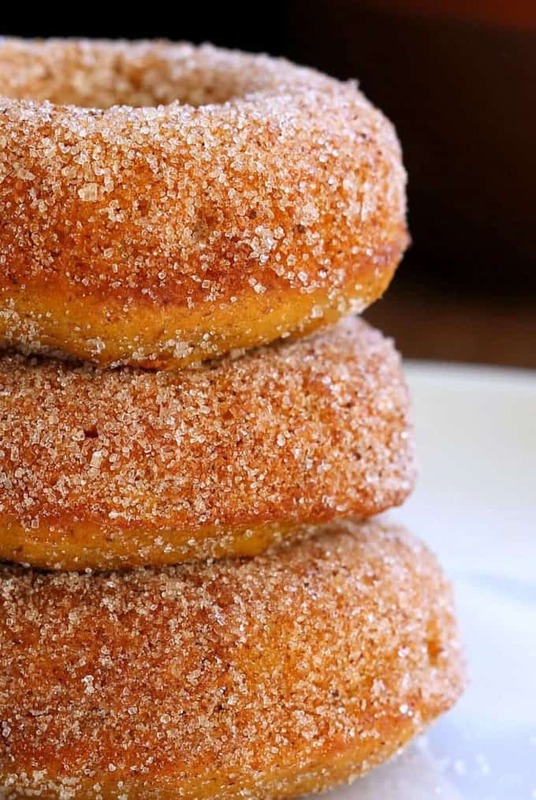 Thanks for including our Pumpkin and Lemon doughnut recipes! Shared! How did you know I have donuts on the brain? I’ve got a donut baking pan, time to put it to good use! We have been eating a lot of donuts lately. Can’t wait to add all of these into our rotation!! Thanks for including a couple of mine! yum! what an excellent round up. i need to get a donut pan!